366 Photo Project - Photo 54: Wicked! I knew I wanted to catch a show in London so the toss up was between Lion King or Wicked. Our Londoner friend, Anita, suggested we go onto lastminute.com to find cheaper tickets. We were really skeptical about booking because the seats you end up with are based on random drawings. Their disclaimer basically said they try their best to give you the best selection. After an hour of comparing prices and looking up restaurant reviews, we decided to book a dinner and show combination at bbar restaurant. We were pleasantly surprised with the level of service. Despite having a very set dinner menu to choose from that was already prepaid, the servers were still very attentive and earned their well deserved gratuities. We absolutely had to have a picture with the sign but with few options of passerbyers to lend us a hand, we opted to use the famous stick. It really isn't meant for heavy cameras but we made it work. Couldn't keep the stick out of the photo though. We got to Wicked and I was so sad to find out that they sold candy, chips and alcohol but no popcorn! I know, ludicrous right?!? Wine in tetra pack juice boxes but no popcorn! Empty handed, we headed up to the second balcony to our seats. A few minutes after settling in, some girls inform us that we are in their seats! I pull out our tickets and we were in the correct seat number. My thoughts were, "Nooooo... lastminute screwed us!" I seek out an usher to tell him our dilemma and he tells us we're in the wrong section of the theater! We were actually on the floor level! "Yeeees! lastminute is awesome!" Wicked turned out every bit as wonderful as everyone has boasted. Jamie didn't even fall asleep so that in and of itself, goes to show how good the show was. That's right folks, I am 100% posing with a phone booth in London. 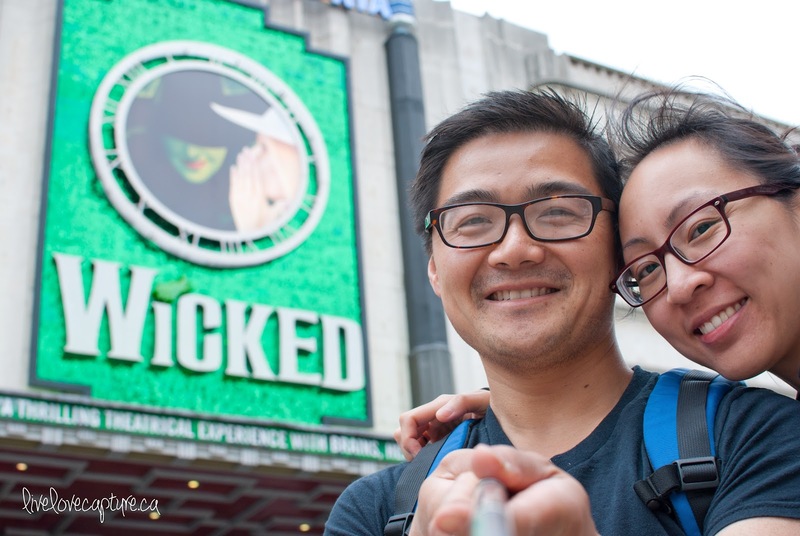 We had just finished our pre-show dinner at bbar Restaurant and were heading to the Apollo Victoria Theater to catch Wicked. 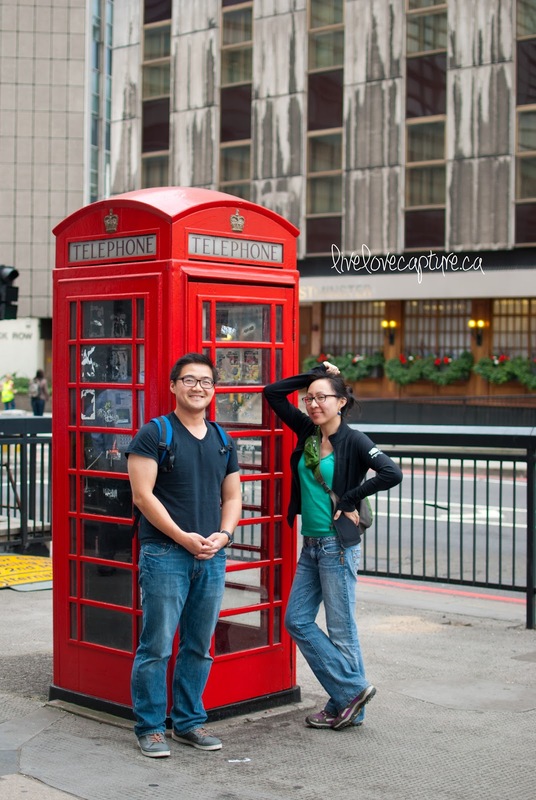 We saw a lot of typical London things and I'm glad we were able to prop our camera up on some pole, set the timer and run back to be a poser by the famous red phone booth. Turned out pretty decent for having no one actually behind the lens. Looking back at this photo makes me smile because Jamie looks like a little school boy and he's just so darn cute. As for me, I'm just trying to be too cool for school. We only carried our big camera around in London because it was just so convenient to take iPhone photos instead. I haven't gone through all our Europe photos yet so hopefully I don't regret tucking away our main camera. Those that have been to my house might think that Khuno sheds all year round but he has his periods of massive shedding. You can usually tell it's shedding time when you can pull large quantities of fur off his snout. This past weekend Jamie and I decided to tag team the brushing and after 2 hours of brushing and Olympic catch up on the PVR, this is what we were left with. I ended up trimming a lot of his gross fur, especially on his underbelly. Jamie said he looked like a sheared sheep. What I really enjoyed doing (kinda sick I know...) was taking my metal comb and slowly picking at the underbelly fur. It was almost like combing a fro or what I'd think picking at a fro would feel like. I was able to take his super short underbelly fur and just work it with my comb until the fur became long and loose again. I was able to extend his fur by almost an inch! Eventually Khuno got tired of getting manhandled and we figured one grocery bag of nasty fur was enough. Swedish Jewellers, I Have Not Forgotten. Remember over a year ago when I blogged about my hatred for local Edmonton store, Swedish Jewellers? They came up in conversation yesterday and not for a good reason. I was watching TV and noticed a weird noise when I was playing with my rings. It almost sounded like a "clink". I look down and decided to check my diamond and of course, it's so loose that I can almost rotate it a quarter circle. I've never owned rings with stones set in them before so I really have no idea how normal it is for a diamond to get that loose, but come on! I had it checked last winter by Independent Jewellers and the gentleman assured me that the diamond was fine. I'm not saying that Swedish did a crappy job. I just want to share the fact that they were indeed, the last ones to do any work on the ring. You can bet your bottom dollar that I am not returning to them to get this issue fixed, even if they do offer lifetime replating with every ring purchase. Screw you Swedish Jewellers. I. Still. Hate. You. That's right folks, it's throwback time! I thought I'd share this rare photo I have in spirit of the Olympics. Can you recognize the fine gentleman in the photo? Better yet, can you recognize the young adolescent female? The photo below is of myself and Olympic gold medalist, Simon Whitfield! He came to visit our humble grocery store, Save On Foods over 10 years ago. All the girls were starstruck and I was working in the photo lab at that time. I remember we all gushed and asked, "Should we ask for a photo?" and the front end manager said, "Sure why not?" I was so excited to get the photos developed that I accidentally opened the camera before I had a chance to roll the film! I gasped and slammed the camera shut, saving all the photos. That's why you see the exposed red streak along the side. It worked out, giving Simon a nice place to put his autograph. He didn't fair so well today in London but he's an amazing athlete nonetheless. Thanks for the photo Simon! 366 Photo Project - Photo 50: Puppy Love? Khuno's cousin, Audi, came over for a play date the other night. They can play for hours as long as Khuno gets rest periods every so often. That night they were taking turns rolling onto their back. Cynthia managed to capture Khuno giving Audi a little lovin'. 366 Photo Project - Photo 49: Ghetto What? Ghetto rain coat, holla! All this rain has made it miserable walking Khuno. This is especially true when it's non-stop rain all day and Khuno's gotta go. I was able to slap on my long rain coat and rain boots but since I was home alone, I didn't want to have to deal with a soaking wet dog on my own. I had bought him a rain coat way back but it was one (or two or three) sizes too small. His underbelly fur gets wet and full of grit so I really wanted to minimize underbelly exposure. I couldn't bring the bag all the way to the end because then he wouldn't be able to pee. I ended up using my hair tie to secure the bag to Khuno's tail. It was working great until the bag started slipping forward, causing his front legs to get tripped up. I had no choice but to pull it back a bit and I got stuck with some pee going into the bag. I'll have to whip up something better in the future, but for now the ghetto rain coat kept a good portion of him dry. Don't judge. Unless your judgement is, "Wow so smart!"